Shaar HaShamayim siddur – Weekday, Shabbat and Festival prayers, Yotzerot, Passover Haggadah, piyyutim and Selichot for fasts, book of Tehillim with Maamadot. With a kabbalistic commentary to the prayers entitled Shaar HaShamayim – by R. Yeshaya HaLevi Horowitz – the holy Shelah. Includes an anthology of laws and customs, by the editor and publisher R. Avraham Segal Horowitz of Posen (Poznań), great-grandson of the author. Amsterdam, . First edition. Complete copy comprising all the parts. 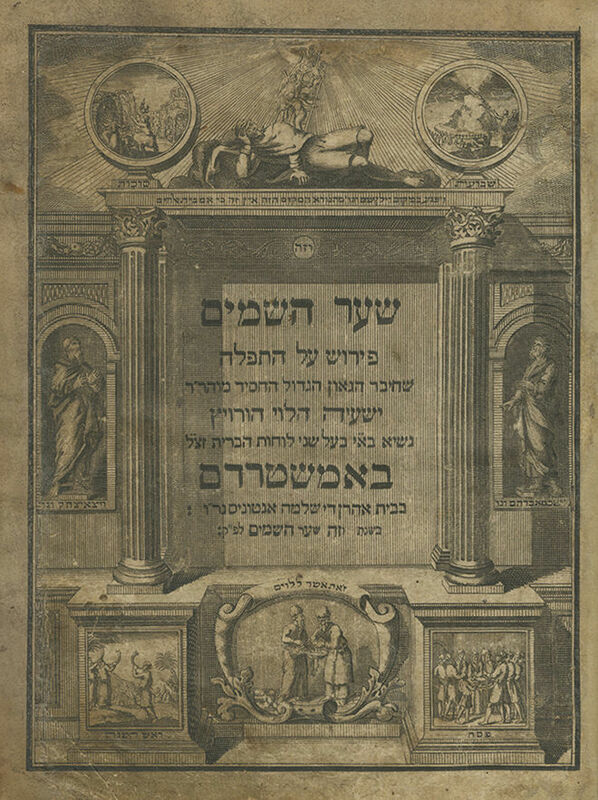 With four title pages, including an additional, copper-engraved title page depicting the figures of Avraham, Yitzchak and Yaakov and illustrations of the Festivals. Separate title pages for the book of Tehillim and Seder Maamadot. The Shelah wrote in his foreword to the siddur: "Blessed be G-d… who guided me in the correct path… and brought me to the holy city of Jerusalem, on Friday of Parashat Vayetze 1621… the gate through which prayers rise… via Shaar HaShamayim (the gates of Heaven)". In his will, printed at the beginning of the siddur, he added: "I thought to compose this holy work, in order to print it and distribute it throughout the Jewish world, so that I may have a merit and share in all the prayers of the Jewish people". The text of the prayers in this siddur on the whole follows Ashkenazi rite, apart from some prayers which were printed in both Ashkenazi and Sephardi rite, side by side. This was done following the author's will printed at the beginning of the siddur (though in practice, the compiler and publisher did not incorporate all the author's instructions regarding the textual variations in the body of the siddur). Praying from this siddur bears the special segulah of the prayer being accepted and not going unanswered. As the Bach wrote in his approbation to the siddur: "We have no doubt that when it will become widespread amongst the Jewish people, whoever prays from it will not have his prayer rejected". R. Avraham Yaakov, first Rebbe of Sadigura, mentions this segulah in his approbation to the third edition of the siddur (Warsaw, 1882): "Siddur Shaar HaShamayim by the holy Shelah, as the renowned scholar, the Bach, testified… there is no doubt that whoever prays from it, his prayer will not be rejected". The holy kabbalist R. Naftali Katz, author of Semichat Chachamim, ascribes this segulah to the author himself, the Shelah, as he writes: "…order of prayers… from the beginning of the year until the end of the year, arranged and composed by R. Yeshaya Segal author of Shenei Luchot HaBrit, and he was very attached to this siddur, and directed his descendants to publish it, to give the public the privilege of praying in this order, with these kavanot, and pledged that whoever prays with all his might in this order with the kavanot, his prayers will not go unanswered. Go out and see how people practice, and the approbations of the great Torah scholars of that generation… R. Yoel Sirkis author of Bayit Chadash, and R. Yaakov Rabbi of Lublin… R. Yom Tov Lipman Heller author of Tosfot Yom Tov… and they all concur that whoever prays with these kavanot, his prayer will not be rejected". The Baal HaTanya reputedly prayed in his youth utilizing the Shaar HaShamayim siddur, and following the kavanot of the Shelah (Beit Rebbi, Berdychiv 1902, p. 2 chapter 1). Signature on leaf : "Elchanan Henli Segal". Lengthy inscription in Ashkenazic script on p. 286b, completing the text of Avinu Malkenu. Complete copy. , 4-335; 139; 130; , 52 leaves. 21 cm. Overall good-fair condition. Most leaves in good condition, several leaves in fair condition. Stains and wear. Dark stains, wear and distinct signs of use to some leaves. Tears to first two title pages, mostly to margins, professionally restored with paper. Damage and tears to last leaves and several other leaves, affecting text, some professionally restored. Leaves trimmed, affecting headings of some leaves. New, elegant leather binding.